A magnificent crater lake nestles in a centuries-old volcanic crater a short distance east of the town of Santa María del Oro in Nayarit. The connecting road from Highway 15 first passes through the former mining town of Santa María del Oro and then rises slightly to offer a splendid view of the beautiful slate-blue lake (known locally as “La Laguna”), set in a ring of verdant hills. In recent years, the lake, a good example of a geomorphosite, has become important for tourism with accommodations ranging from RV spaces to a boutique hotel. It takes about an hour and a half to stroll round the track that encircles the crater lake. Other attractions include visiting an abandoned gold mine (which offers a glimpse into the area’s past), birding, mountain biking, swimming or hiring a rowboat or kayak to venture out onto the lake. This usually quiet lake has proved to be a valuable source of information for geologists and climatologists investigating the history of climate change in this region of Mexico. The researchers who published their findings in 2010 in the Bulletin of the Mexican Geological Society extracted a sediment core from the deepest part of the lake. 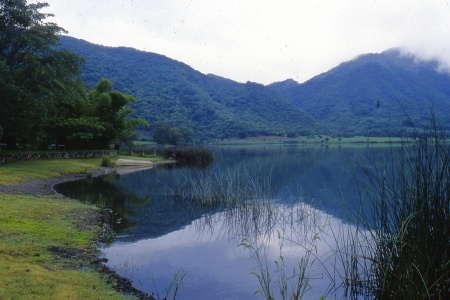 The relatively small area of the drainage basin surrounding the lake and the relatively steep slopes of surrounding hills mean that the sediments entering the lake are rarely disturbed after they are deposited. Wind and wave action are limited. The depth of the lake (maximum 65.5 meters) also helps to ensure that sediments remain undisturbed for centuries. This gives perfect conditions for a reliable sediment core. The team analyzed the titanium, calcium and magnetism levels of successive thin slices of the core. By comparing the core with historic records and previous tree ring analyses from the same general area, they were able to accurately date each slice. The titanium levels in each slice allowed the researchers to quantify how much runoff occurred in that year, a proxy indicator of precipitation. The team identified 21 significant drought events over a period of 700 years. The six most marked droughts occurred in 1365–1384, 1526, 1655-1670, 1818, 1900 and 1930-2000. They found periodicities of 25, 39, 50, 70 and 117 years for drought events, meaning that droughts occurred at fairly regular intervals of about 20-25 years. The researchers then looked at the possible correlation between periods of drought and two distinct climatological factors: a shift to the south in the position of the Inter Tropical Convergence Zone (ITCZ) in summer and the occurrence of El Niño Southern Oscillation (ENSO) events. When the ITCZ does not extend as far north as usual during Mexico’s summer rainy season, states such as Nayarit and Jalisco receive less than their normal amount of rainfall. During ENSO events, rainfall is also diminished in central and western Mexico. Of the 21 droughts identified and studied, 7 proved to be statistically linked to ENSO events, 10 to ITCZ movements, and the remaining 4 events were closely linked to a combination of both. Santa María del Oro is also worth visiting because it is only a short distance away from the edge of the canyon of the River Santiago and the El Cajón hydro-electric power project, one of three major HEP projects located along that river. Susana Sosa-Nájera, Socorro Lozano-Garcí, Priyadarsi D. Roy and Margarita Caballero. Registro de sequías históricas en el occidente de México con base en el análisis elemntal de sedimentos lacustres: El caso del lago de Santa María del Oro. Boletín de la Sociedad Geológica Mexicana, Vol 62, #3, 2010, p 437-451. Santa María del Oro and surrounding areas are described in chapter 24 of the recently published 4th (Kindle/Kobo) edition of my Western Mexico: A Traveler’s Treasury (Sombrero Books, 2013).